Hello, Jon from Marketingforowners.com, the podcast where we teach small business owners just like you and me how to use modern marketing to further out businesses. Today, it is the general election in the UK which is in theory a day of turmoil where everything can change, but I have a sneaky suspicion it won’t. It will just be the same old, same old, boring, boring. Whatever! Anyway, what I want to know is how have they, with everything that everybody knows, how would they used modern marketing and social media, video and things like that to further their campaigns. And the answer is they haven’t, they have personally disappointed me. With everything that is available and with the evidence of what Barack Obama did in the USA many years ago in his first campaign, it is ridiculous. What it tells me is that the political parties are run by a bunch of old men who are not in touch with the modern world. They have no long term admissions. Their only aim is to get past the post and get in to power, and that’s it. No long term, so whatever they say, to me, as a voter, that’s what this, that’s what’s coming through, is that they just want to get into power. Now, they, whatever they say for long term doesn’t really matter because they don’t think they’re going to be there. Now of course, they may disagree, but I am saying how I feel and I’m a voter and that’s what counts because I’m their consumer. More importantly, they have new consumers coming into voting age at the age of 18 every single day. And those 18 to 24-year-olds, they are future voters for many, many years to come are using social mediabut please, hop on Instagram. Look up under the political party. Go on YouTube; see what videos they have put out. Look at their Tumbler blog page. Go on Medium, see if they mention there. Look at their blog. See about their posts online etcetera. You won’t find anything or, if you do, it’s going to be light. It’s not much. It is far from impressive. Now, why does it matter? You might say. It matters because these people who are coming in at 18 generally are going to form their opinion as to who they can vote for in the future. A lot of people don’t change their minds when they vote. Many follow what their parents do and what their grandparents do and all that kind of stuff. But these days, everyone makes their own mind up. They ask for opinions and they ask online and they look and they form in their research. There isn’t much to learn. So, for example, back in Barack Obama’s scene, you’d see pictures of him, photos of him with the kids watching TV at home. You don’t see any of these. Everything in the UK is staged. It’s all staged with a bunch of people behind the camera and you can tell it’s staged. You’ve got some people try and get into social media. Nigel Farage, UK, likes all his own posts on Facebook which is not good from people. But, what could have been done? Personally, with all the money that gets spent and of course nothing like America which is a bit well, it’s another story. But with all the money that does get spent, I would have gone into someone like Gary Vaynerchuk, VaynerMedia, who’s massive and is a cutting edge of everything. And Roderman as a consultant said Right, what can we do to get voters to be involved to like us and to vote and to build relationships for the future, for the ongoing future? Because it’s going to be another election in five years’ time and another one five years after that or, was it four years? No, I think that’s fine. Anyway, there are going to be many elections, so we want those people to love us. What can we do? We can start now. Of course, they are not going to do it. They will have only started their campaigning when the campaign started. There’s going to be another election in years to come. Use social media, build relationships, get people to like you. When you make a mistake, you can jump on Twitter and go, hands up. I may vote it, I fell over. I said the wrong words.People will appreciate the honesty but what you can see is that they are too scared to say the wrong thing. They cannot trust their party members not to put their foot on it, on social media. They need to be in control. The people that are in control in the background of the campaigns need to be in control of everything. That to me shows, makes me not to trust them, shows a lack of transparency and that is not modern marketing. Okay. I don’t often have a rant, so sorry for ranting but, that’s my opinion. I’m pretty sure I am not alone. There is an opportunity to become liked. Be where we are, talking our language, don’t act like a load of all doofus. Perfect example, SNP, the Scottish National Party, lost there one off Scottish national, their referendum with Alex Salmond. Alex Salmond kicked out bringing the lovely Nicolas Sturgeon, a woman. Yes, people, you women are brilliant. They can be NPs. What is wrong with your people? Oh, your , political people. Bring in Nicolas Sturgeon. Wipes the floor the first thing and is now liking to reload the seats. I bet you wish you had her in charge for the referendum. Yes. Get modern. Do this stuff, change start planning for the future right now. Now after that podcast, we need a calming podcast to drive home or to listen while we’re making a dinner. 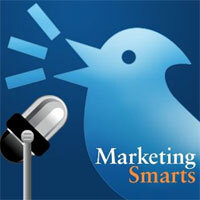 I am going to recommend Marketing Smarts. Now, this comes from the marketingprofs.com, a lot of van handling and etc. It’s a weekly 30-minute podcast. They interview top people and they ask the right questions and they get the right answers.Marketing Smarts is a wonderful podcast. It began a long time ago, and it is very professionally done. I think their site said, joins 600,000 other marketers so, good stuff. Go have a look at that. If you found anything that UK political parties have done well with their marketing, send me a message. Let me know. I would love to see it because I couldn’t find anything. Speak to you soon. 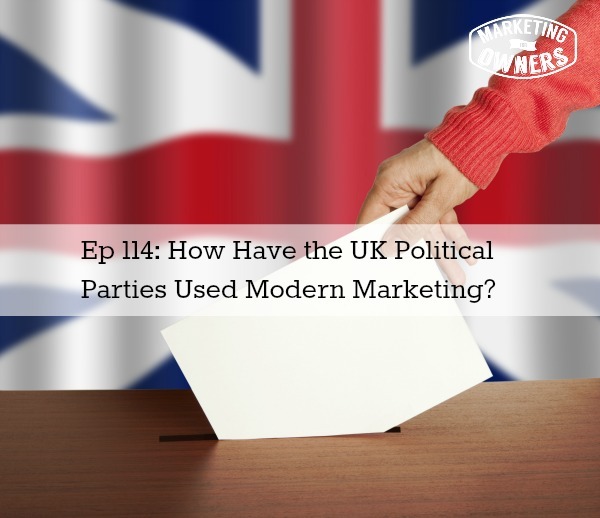 Have you ever seen any of the political parties use marketing successfully?